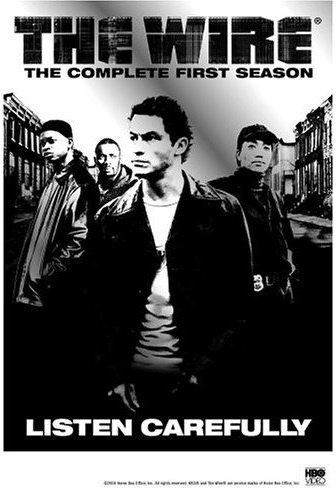 last night on bbc 2 the first episode of the wire was screened and they are going to show all 5 series which is great news! if you missed it go to iplayer and catch up. everyone i speak to at the moment seems to have just discovered the wire in the last few months (unless they are in the US and it's old news). my sister gave me series one on dvd back in february for my birthday. i've got one programme still to watch and i'm hooked. it takes a few programmes for the plot to get going and to get used to the baltimore accent and i know a few people who started with subtitles on (!) but if you make it to episode 4 you're there. the language is street - be warned. if you like your viewing squeaky clean it won't be for you. and the soundtrack theme song way down in the hole by the blind boys of alabama is brilliant. thanks nic and esther for first putting me onto it. congrats jim and mary. yesterday was a great day all round. jim was very emotional before and during the service, and in his speech which was just lovely. fractured or networked - depends on the lens you look through! here's my thought on this. if you look at this through an old lens - denominational or tribal - it looks like a problem. but if you look at it through a network lens it's exactly what we should both expect and hope for (though i wouldn't use the word fractured as that sounds very negative). i blogged previously about small world theory which i don't want to go over at length again. but to recap a couple of points. people can only hold a certain number of meaningful relationships, most people are locally focused (in their small world), it only needs one or two people in any small world to be connectors to other small worlds and suddenly the insights across the various small worlds (or movements as mark calls them) can flow around the network. the key point therefore for any movement is having a particular edge and practice, connecting with others but then encouraging some to focus externally so that that movement isn't insular. my fear around mark's post/headline is that people will think fracture, spilt, difference, disagreement. whereas i'm looking and thinking diversity, network, connectivity, flows, insights etc... it all depends on the lens you look through! i wrote a piece on the spirit in which this might be conducted called the network of christ which you might like to read if you didn't catch it. ...the renewed zeal for mission in the Church of England is bringing to birth its own fresh expressions of religious life. 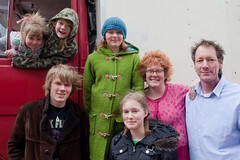 The Church Mission Society is the first of several established missionary bodies to become an Acknowledged Community... These communities coming from across the spectrum of church raditions are discovering the religious life to be a missionary imperative. so i guess it's now public news (even though it was approved a few months back) so i can let you know that cms has been recognised as an acknowledged community of the church of england. what does this mean? well it means that cms is at its heart an ecclesial community with a rhythm of life and a mission spirituality and ethos that is at the core. it's a fresh expression of church in and of itself. in saying that it doesn't mean church in a congergational gathered mode but church has always functioned in a number of modes - the congregational one has tended to be the one that has dominated our imagination. we will have (yet to be appointed) an external visitor to the community who is a bishop. Christian communities that emerge out of very particular cultural contexts where the traditional church is basically irrelevant. These cultural contexts are more often than not urban, youngish, and post-modern. Emerging church is not a worship style. I know emerging churches that do traditional liturgy with jazz (Mercy Seat), who use electronica (Church of the Beloved), who are a capella Gregorian chant (House for All Sinners and Saints), and who do nothing but old-time Southern gospel (House of Mercy). So, when traditional churches in the suburbs are wanting to attract young people (with all the good intentions in the world) and they ape some kind of worship style they read about in a Zondervan book by starting an “emerging” worship service, it’s a bit … ironic. There is nothing ideal about these communities. Yes, we need more generational diversity. And yes, we have the same number of issues and problems as other churches. All I know is that about 95% of the people who come to my church were not actually going to any church at all when they joined us. Okay, now before you leave me angry responses let me say that this is not saying there is something wrong with the traditional church. Traditional church is often a faithful expression of Christian community. But people in my scene would have to culturally commute from who they are to who the traditional church is. so the next phase in the jones' life is travelling round europe in a van and tents, meeting creative mission leaders and church planters and people that throw good parties to hang out, encourage them, map some of what is happening in europe, research the gaps, catalyse some new stuff, create some networks, tell some stories and so on. 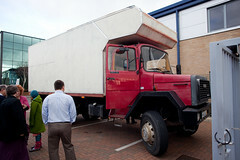 they have an incredible overlander truck which is semi-converted and they'll do a bit more on the road. a few people have asked how long this is for but it's open ended - travelling as a lifestyle i guess. the van and jones will be back in the uk next at greenbelt so catch them there if not before. follow andrew's blog to see how it all goes and if you are doing some creative mission type stuff in europe introduce yourself. cms has historically worked in africa and asia and in recent years done quite a bit in the uk. this adventure is part of a shift to more of a european focus. plenty is still going on in africa and asia (and now south america with the link with sams) but the direction for those areas is to let go control and western leadership and to be a networked family of mission agencies round the world rather than a british governed global agency. if you are a praying type, pray for the jones as they go. got to admire the adventurer spirit. i work with some fun people! hey bro my fro's bigger than your fro, originally uploaded by jonnybaker. well another parental rite of passage - had 50 friends of harry's at ours for a party last night for his seventeenth. it seems ages since joel's! a beautiful evening meant we could use the garden with candles everywhere and the fire burning, and we had a sound system in the lounge with joel and friends playing tunes (we moved everything out that was remotely breakable or valuable) . harry had made it fancy dress - come dressed as a song title. there weren't prizes but the most impressive entrance was adam as 99 red balloons! it meant for some crazy outfits... i didn't take many photos - it was all very dark but this is joel and harry comparing 'fro's. harry will add the rest to his facebook i'm sure. 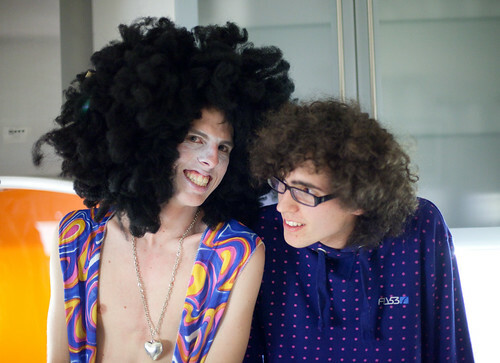 harry started the evening dressed in an ice cream outfit but swapped with chris later in the evening. all good fun, no damage, no breakages, no neighbourly complaints (yet), and no one seemed to drink too much... wow! the pressure is now building as we need to begin planning next year's having gone nuts for joel's eighteenth! 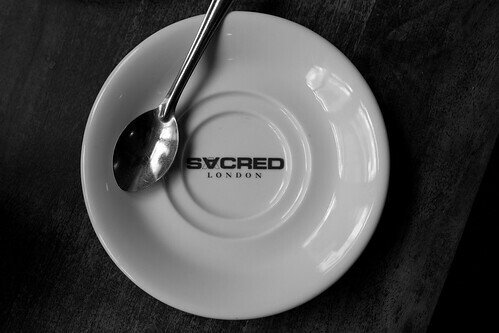 sacred london, originally uploaded by jonnybaker. i am taking part in a stations of the cross exhibition in oxford from 2-16 april in the jam factory. the station i have got to interpret is the release of barabbas. i am looking forward to it. the jam factory is a neat arts cafe/bar. the exhibition is organised by stillpoint. as i work in oxford two days a week now i think that qualifies me to take part! this is the invite to the opening night. it's a big bar - there's room for a ton of people so do come along on thurs april 2.
awash from jonny baker on Vimeo. this is a movie taken with the canon 5d mark ii, my new camera. it has a function to shoot movies in HD. i have been saving, selling photos, doing photo shoots and anything else i can think of in my spare time as it's quite a step up from the entry level canon 350d that i have had for a few years now that i have loved and taken some great photos with. already i have been amazed at the quality of photos particularly in low light - the lack of noise at say ISO 2500 is amazing. well you can also shoot movies in HD on this camera which means filming with canon lenses. it's not why i bought the camera but i was sat in a car wash at the weekend and thought i'd try it out. i cannot believe the quality of the movie - this is it uploaded and compressed so has lost some detail but i think you can still tell. You hide the path you want for us under the path we walk. You bury wisdom in the places we pass. Give us, God, the determination to dig. broken|whole, originally uploaded by jonnybaker. had a good week at lee abbey. 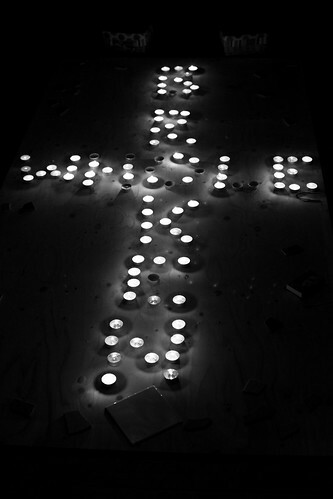 the last night we did a communion service on the theme of wounded in all the right places and this photo is from that. i had a load of writing to do while i was there so hid away most spare time so didn't get out with the camera much though i did find a wonderful walk down to heddons mouth and have added a few photos from that to flickr. it's better to receive than give - grace this saturday continues the theme of gift. on the blog that is. i am currently at lee abbey teaching and leading on worship. but there is no mobile phone signal and no wireless internet. i found a lead in the back of a computer in the chapel to plug into momentarily but i guess i won't be blogging much. so have a few days off my spam everyone! i'm a little worried there might not even be a tv so how will i follow the chelsea match tonight?! i have been asked to rework my rejected preaching chapter from a few years back into a grove booklet so i am working on that in the spare moments. i'm sure that stuff has had more of a life by not being published than it has if it had been in the book! i wish i could have voted for barack obama, originally uploaded by jonnybaker. on friday jen and i went to the late opening at the tate (amongst other things i was trying out a new camera in low light - the ISO is unbelievable - so little noise at 1600). soweto kinch was playing in one of the galleries. 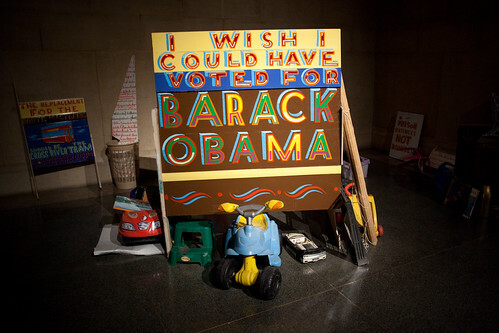 he has done a project with the gallery to take 6 pieces of art and create interventions and put a ghost in the machine. you can get a set of headphones from the desk and listen to his interventions (music, poetry) which riff off the pieces of art. he did his usual brilliant free styling though his VJ was possibly the most hopeless i have seen in my entire life! this was a temporary installation - a new one is being added each week in response to the altermodernity exhibition.